Pune: President Pranab Mukherjee in his valedictory address emphasised that as engineers in uniform, the graduating officers will face greater challenges in view of the increasing complexities in the infrastructural requirements of the defence forces, especially in inhospitable terrain and on our mountainous borders. In order to meet these challenges, he urged the young officers to keep themselves updated with advancements in the technology. “Building infrastructure in the remote areas of the country is one of the biggest challenges and enormous responsibility rests on you as engineers. I am sure you will make full use of the technical knowledge and expertise gained here to meet these challenges. In the rapidly changing environment, one factor which has not changed is the faith reposed in the armed forces by the entire nation,” he said. “The Indian Army Engineers have traditionally left their mark on prestigious national projects be it oil pipeline at Siachen, prestigious naval bases and airfields in the north and northeast or roads cutting through the Himalayan ranges. 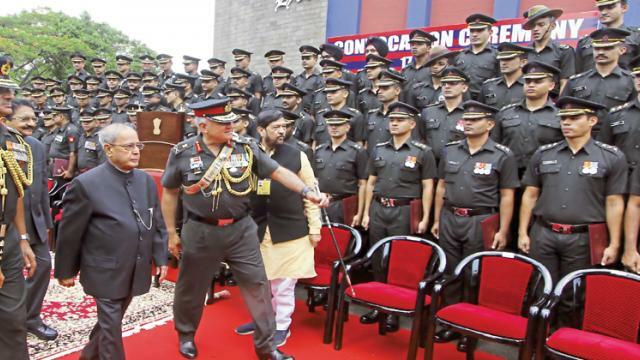 I am sure that each and every one of you will also follow the footsteps of your illustrious predecessors and will live up to the high standards expected of you,” Mukherjee exhorted the officers.